One of the first signs to be completely replaced with Gov. 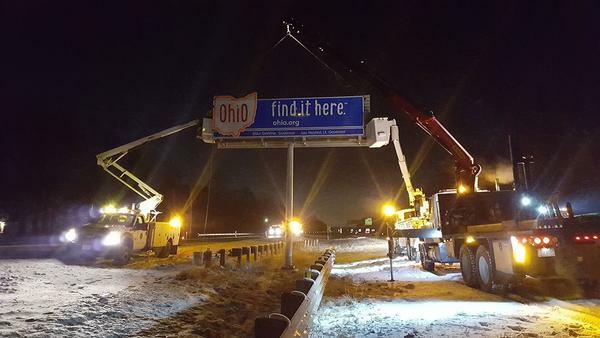 Mike DeWine's name went up over the weekend on U.S. 23 near Toledo. The signs are meant to last at least 20 years, so ODOT usually just replaces the names of the governor and lieutenant governor. But ODOT spokesman Matt Bruning said because the state’s tourism logo changed in 2015, all the signs were set to be replaced. “We decided that it just made more sense if we’re going to change the signs to kind of hold off and wait until the administration change," Bruning said. There are nine signs that still have the “Heart of It All” slogan from the 80s. Four signs were replaced recently with the “Ohio: Find It Here” logo - including the largest ones, the 40-foot long signs over I-70 at Indiana. It will take a few weeks and $100,000 to replace the remaining 32 signs, with half of that paid by the tourism department.